CHASING FOOD DREAMS: Ee Chinese Cuisine, Eastin Hotel Kuala Lumpur: It’s Time for a Reunion! Ee Chinese Cuisine, Eastin Hotel Kuala Lumpur: It’s Time for a Reunion! Back for Chinese New Year Menu at Ee Cuisine! Checking back into Ee Chinese Cuisine at Eastin Hotel Petaling Jaya, patrons can whet their appetites this festive season with their auspicious Chinese New Year menus created by innovative Chef Yong Kam Wah and his team. Choose from a range of their Sou Gong set dinner to Reunion set dinner and Chinese New Year set dinner menus to usher in the festive New Year with family, friends, loved ones and business associates. Starting off with the auspicious Yee Sang is a must at Ee Cuisine. The best part of the ‘Lou Sang’ is seeing family and friends coming together and sharing good wishes for life. Choose from more than eight choices of Yee Sang, priced from RM98++ per portion for Jellyfish Yee Sang to other variations like White Tuna, Smoked Duck, Sea Bird’s Nest, as well as the luxurious Australian Lobster Yee Sang. The Yee Sang is available from 7 January until 24 February 2013 for dine in or take away. It’s superbly refreshing! Doused with lots of fresh lemon juice on the salmon, it certainly perked up the whole yee sang. What makes this one memorable? A great citrusy note lifted up the abundance of finely shredded vegetables, crisp yam, crispy rice crackers and luscious salmon. Eating lots of this yee sang is easy because of its refreshing flavors and lovely textures. I love unique creations, especially ones that work deliciously! Ingeniously created by Chef Yong, he steamed custard filled with shark’s fin, crab meat and egg with savory flavors. The island of custard is then placed in a golden orange pool of silky carrot bisque. The wobbly custard tantalized the senses with creamy egg flavor and sweet crab meat while the carrot bisque rendered superior broth filled with loads of meaty essence that stick to one’s lips. It’s near perfection in my books and I would certainly love more luscious broth. Modern and insanely good!! Smoke gets in your eyes… at least this was the first thing that came to my mind when I saw the dish. As the cover lifted, a cloud of smoke quickly dissolved right before my eyes while the smoky aroma hits my nostril. A classic dish that appears on major tables during festive season, the version here is delicious with Ee Cuisine’s special spicy green chili sauce and ginger sauce. The chook has a firm bite with smooth skin, a representation that the chook got its exercise to roam free to be able to produce such a texture. Flavors are delicate and wholesome but can be jazzed up with the two sauces for extra kick. Normally not a fan of dried oysters, I must say that the oysters here are nicely paired with sea cucumber for a better texture and flavor combination. Right smacked in the middle is the precious braised abalone accompanied by broccoli and black moss. Flavors are quite robust to counter the heaviness of the dried seafood. Though separated, the flavors of the assorted waxed meat are definitely present in the rice. The festive ingredients are steamed with the rice to let the flavors meld together before being presented separately. I like the rice for its fluffy texture tainted with glorious sweet and caramelized meat essence. Present that day was waxed duck, waxed pork belly, Chinese sausage and Chinese Wine sausage. I am particularly fond of the Chinese Wine sausage for its robust sweet notes and aroma. As always, the night has to end and it always end on a sweet note! The sweet broth was warm and soothing, cleansing away the heavy notes of the luscious dinner. I am glad it’s not sweet at all for a healthier touch. This one was another unique creation by Chef Yong. Creatively bundling the auspicious Nian Gao into a mocha rice skin and covered with coconut, the dessert has a slight chewy and soft texture with hints of sweetness. Starting with the Sou Gong Set Dinner, available from 7 January to 8 February 2013, one can feast on a luscious menu priced from RM1388++ per table of 10 persons. 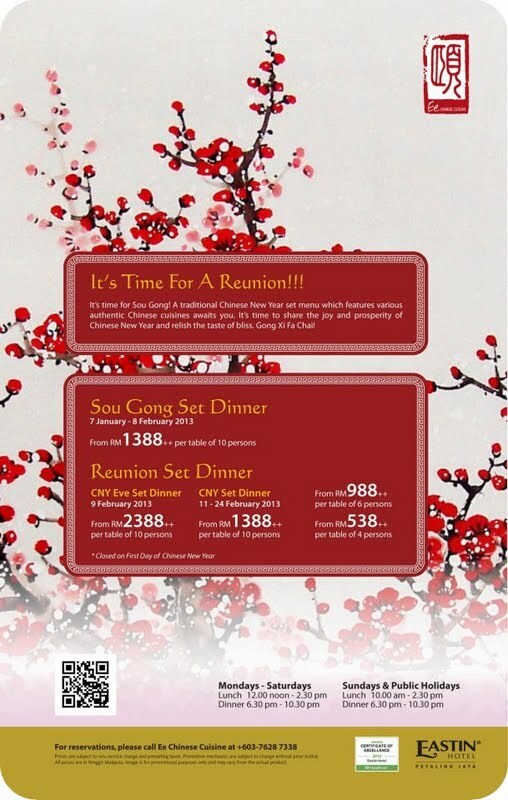 The Reunion Set Dinner at Ee Chinese Cuisine is offered on Chinese New Year’s Eve on the 9 February 2013 from RM2388++ per table of 10 persons with an exquisite menu of Abalone Yee Sang, Assorted Waxed Meat, Oven Baked King Prawns with Cheese Sauce and more. The Chinese New Year Set Dinner available from 11 February to 24 February 2013 starts from RM528++ per table of 4 persons to RM1388++ per table of 10 persons. Make your reservations at Ee Chinese Cuisine this festive season for an unforgettable merriment of get-togethers and luscious set menus! *My previous visits to Ee Chinese Cuisine here, here, here and here. I love the super fresh & bouncy prawns! The nian gao was in a mocha and pumpkin skin? Whoa sounds quite funky... can't imagine how it would taste. Those bacon rolls look delish too! The salmon roses are so pretty.